South Dakota Sen. John Thune announced in a statement today that he will not seek the presidency in 2012. The Republican said in a statement posted to his Facebook page that he's received encouragement but "at this time, I feel that I am best positioned to fight for America’s future here in the trenches of the United States Senate." "I want to thank those who have encouraged us and prayed for us during the past several months. We are forever grateful for all the support," he added. Thune began flirting with a presidential bid last year in part because he received so much encouragement to run, and because the rest of the developing Republican 2012 field appeared weak. He said he would announce his plans by the end of February, but he had seemed torn by the decision. He has not trekked into the early nominating states as other potential candidates have. 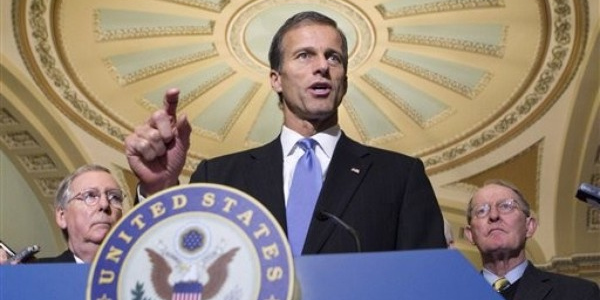 Thune's decision will allow him, however, to move up in the Senate. Now that minority whip Jon Kyl, the second-ranking Republican in leadership, has announced he will not seek another term in 2012, Thune's decision means he likely will seek the whip position. Thune is ranked fourth in the leadership structure as chair of the Republican Policy Committee. Texas Sen. John Cornyn, the National Republican Senatorial Committee chair, already has made clear his intention to seek the whip slot after Kyl leaves. Thune also may come under consideration to be the eventual Republican nominee's running mate next year.